It's the beauty treatment that lasts a lifetime. We're talking about the granite finish. This process adds contrast and enhances the natural look of your granite. 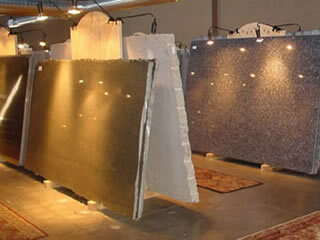 The finish also adds durability to the granite by reducing the stone's porosity. The following standard finishes are available from our list of area fabricators. Other custom finishes can be produced on a special order basis. The Polished finish is a highly reflective, mirror gloss finish. The full color, depth and crystal structure of the stone is visible. A polished finish seals surface pores and is, therefore, nearly impervious to chemical wear and weather. A smooth, satin surface without reflection, the Honed finish shows the full color of the stone. It is produced on the same equipment as the polished finishes however, the honing process ends prior to the buffing stage. Diamond 8 is a honed finish plus an additional process that enhances the color and removes microscopic crystals that may leave a hazy appearance. Recommended on darker granite colors. The Thermal finish is produced by applying a high-temperature flame to the surface of the stone. This flame fractures crystals on the face, leaving a rough-textured finish. Highly skid-resistant, this finish is an excellent choice for walking surfaces. The Diamond 10 is a thermal finish with an added water jet treatment to enhance the color and appearance of the stone. Highly recommended on darker granite colors. The Antique finish is produced by first applying a thermal finish, and then a brushed finish to smooth out the characteristics of the stone structure.